This is the notice for my grandfather's death, my mother's father. 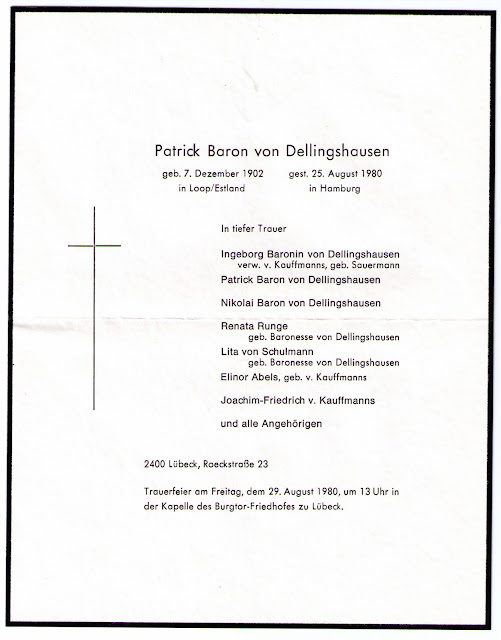 Patrick von Dellingshausen was born December 7th 1902 on the family manor of Loop in the Russian province of Estonia. He died August 25th 1980 in Hamburg. He had two daughters from his first marriage (1926-1940) to Maria von Stackelberg, my mother Lita (1929-2009) and her sister Nata (1927-2009). He had two sons from his second marriage (1941-1980) to Ingeborg Sauermann , Patrick(1942) and Niki (1944). Niki happened to drop by for a visit on Tuesday out of the blue. Patrick also had two step children that came from his second wife Ingeborg's first marriage. From his four children he had 10 grandchildren, though two of them were born after his death. His first grandchild was born in 1946 when my aunt Nata had a son at age 19. He has 18 great-grandchildren, 16 born after his death. 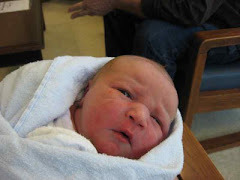 In August his first great-great-grandchild will be born, though there might be a couple out there because the connection to the kids of my aunt Nata's son Charley are very tenuous at best.